How do I Install the Floating License Server? How do I point to the server license using an Environment Variable? Make sure you have downloaded the correct version of Mocha for your operating system. The licensing system for this version is different from v5 and earlier. Make that your version of Mocha is the product you have purchased (You will not be able to use a Mocha Pro AVX Plugin activation code for Mocha Pro standalone unless you have a multi-host license for example.). Linux: Double-click the installation rpm file and follow the on screen instructions. (64-bit versions of the software will not run on a 32-bit version of Linux). Open Mocha and choose 'Activate' from the welcome screen or 'Activate nodelocked License' from the help menu. Reopen Mocha to start using your licensed version! Download and save the key file that you received from your license email from a computer that has Internet connection. 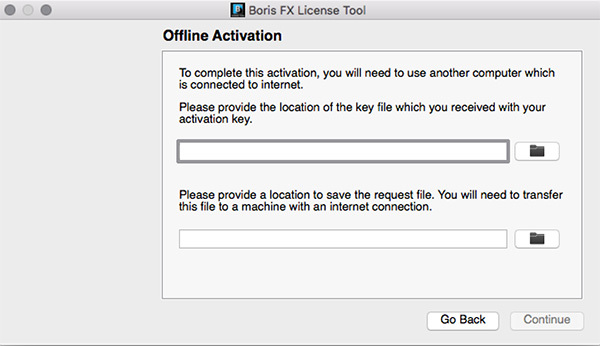 Transfer the key file to your offline machine you are going to activate via a flash/thumb drive or a shared network. Select the location of the key file in the first field. Pick a location for the request file (which will be created) in the second field. Copy the request file (.req) to a machine with an Internet connection. Save the activation file it returns (via download or email), and copy that back to the offline machine. Your license should install automatically and Mocha will close. First locate the licensing button for your host plugin. After that, the rest is the same as the process above for Mocha standalone. 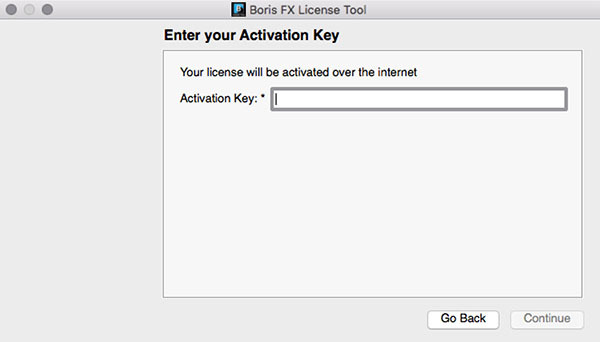 See "Standard Node-Locked License Activation for Mocha Pro Standalone" for more details. We recommend restarting the host if you see any issues with licensing. It is important that your Mocha software matches your activation code, so check your purchase order to make sure everything matches up version wise. It may be that you don’t have the correct version of Mocha installed from our download section. This is especially important for legacy software before V5, where a different licensing method is used. If you are attempting to install via a terminal instead of directly on the machine itself and you are having trouble getting Mocha to install, try installing directly on the machine. Check to make sure you are not restricted to using certain ports due to a firewall or other admin permissions. When in doubt, temporarily turn your firewalls off for the duration of the installation and then turn them back on when you are done. Troubleshoot your machine; try uninstalling all your Mocha software, restarting your machine, and installing the software again from scratch, and make sure you follow installation directions off our website exactly. It sounds redundant, but sometimes it’s a great way to figure out what is going on inside your machine. If all else fails, our support team is happy to help you figure this out. Please contact support! This guide will walk you through the process of installing floating licenses. Installing node-locked licenses does not require the use of the license manager. See above. A floating license allows central administration of your license deployment, avoiding the need to manually activate and deactivate our software on every machine, which is particularly beneficial for large facilities. Configuring a new machine to use your floating license server is very straightforward and requires no internet connection. Similarly, replacing a failed machine can be done without needing to contact technical support for the license to be released. Mocha uses the Genarts RLM License server for floating licenses. 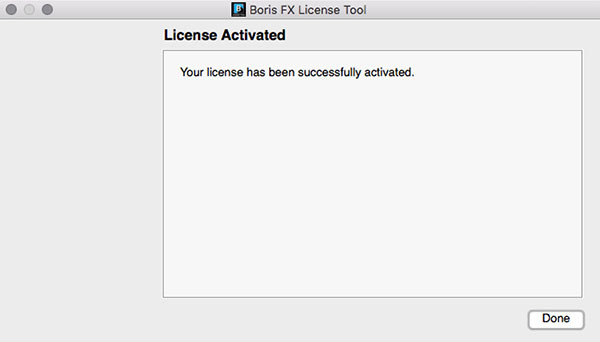 You can download the license server from the Boris FX website. See the steps below. Floating licenses are easy to set up if if you are familiar with configuring network services, but if you need any help with the process, please contact technical support. Download the RLM License Manager from the download section here: RLM License Server. Enter activation.genarts.com in the “ISV activation website” field provided and click “Next”. A default license location will auto-populate in the “License File to create or edit” field. Accept the default license location and click “Next”. The license server should now be set up. To confirm that the GenArts license server is working, go to http://SERVERNAME:5054 (replace SERVERNAME with the name of the server), and click “Status” on the top left hand corner. Genarts should show up under the ISV Servers and it will say Running: Yes. The Ethernet address of the machine you are on will auto-populate in the “License Server or Node-lock hostid” field. You will need to overwrite it with the Ethernet address of the offline license server. Enter the mac address into the online “License Server or Node-lock hostid” field. A default license location will auto-populate in the “License File to create or edit” field. Replace the default location to a location that you can easily write to and access the file, such as your Desktop or the Downloads folder. Transfer the License File on to the offline license server and save the License File to the RLM directory. This completes the License server set up. To confirm that the GenArts license server is working, go to http://SERVERNAME:5054 (replace SERVERNAME with the name of the server), and click “Status” on the top left hand corner. Genarts should show up under the ISV Servers and it will say Running: Yes. Now that everything is installed and activated, you no longer need the RLM server installed on the temporary online computer – you can remove it at this time. If you haven’t yet installed the server license, follow the instructions above in How do I Install the Floating License Server. Create a new file in a text editor called mocha_client.lic. The file name is not important, as long as the '.lic' extension exists. As with any software, problems may arise during the installation process. Please take a moment to read our troubleshooting section and check for common errors. Verify you are using the latest version of the license server software. Check to make sure your License Manager is up to date. If your organization needs to run a firewall, you will need to check if the ports for the RLM server are open for use. Check your purchase order to make sure everything matches up version wise. It may be that you don’t have the correct version of Mocha installed from our download section. This is especially important for legacy software. If you have more than one Mocha license installed on the server or client machine check to make sure they are not expired licenses. While rare, sometimes these licenses can conflict with any current ones you have on your system. If your client machine does not connect to the server based on the server name, try replacing the server name with the IP address of the server instead in the license file. You can easily do this via the License Manager or via a text editor. When in doubt, check the logs! Check logs and their paths: Read the logs from Mocha and from your server, they will tell you all about what is happening to your machine. If your client machine is not able to connect to the server you may have a networking issue. Try changing the server name in the client license to the IP address of the server instead, or check to see if your host has ".local" appended to the end of it. You can also do this in any text editor by opening up the client license and server license and manually editing the server name. You might roll your eyes at this one, but try uninstalling, restarting your machine, and installing the software again from scratch. Make sure you follow installation directions off our website exactly. It sounds redundant, but sometimes it’s a great way to troubleshoot what is going on inside your machine. Our support team are more than happy to help you fix any floating license issues you may have. This section will discuss the installation of floating render licenses and how they differ from standard interactive floating licensed. A render license is a specific kind of floating license that only allows rendering of Mocha project output, be it inside a plugin or in the standalone application. When you are using a floating license, it is broken into two parts: The interactive portion and the rendering portion. If you open the Mocha GUI in the Mocha Pro Plugin (and a license is available) you are entering the interactive portion. If you are back in the host and not using interactive elements such as layer choosing or opening the GUI, you are using the rendering portion of the license. 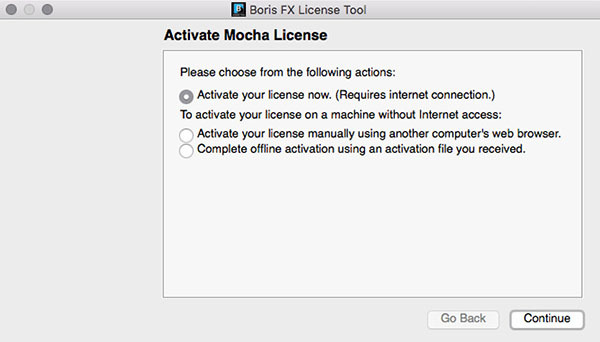 If you open the Mocha Pro standalone application (and a license is available) you are entering the interactive portion. If the interactive license is in use elsewhere or missing, the Mocha GUI will become unlicensed and attempting further work may encrypt your project if you choose to save. If you have no interactive floating licenses available to render with, additional render licenses can be helpful to let you free up interactive licenses elsewhere. The license server is operating with both sets of licenses. If only one person is using Mocha on the network, there are 4 interactive and 10 render licenses still available to use. If only that one person was using Mocha on the network, they would have 15 render machines available for use including the one they were working with. If another person started working and all machines were in use for rendering, their version of Mocha would be unlicensed, as there would be no available seats. There are 5 people working in Mocha. If another user tries to work on a 6th machine, they will open Mocha unlicensed, because all interactive licenses are in use. They open an existing project with Mocha in it (or render from the command line), they will be able to render, because all render licenses are available. If 5 people are using Mocha on the network already, there would be 11 render machines available for use including the one the user was presently working with. If another person stopped working in Mocha, the interactive license would be released, and a new machine would then be free to either use for work (interactive) or render (non-interactive) by another user. The installation of a render license is exactly the same as that of a standard interactive floating license. See the 'Installing Floating Licenses' for a complete guide. If you are planning to render either via the Mocha render scripts, an Adobe watch folder or a render farm (for example in Nuke), there are some file workflows you need to adopt. You will need to make sure the necessary source footage is available for all machines. This includes anything you have imported into the Mocha GUI such as clean plates, insert clips and other imported files. Pointing to the same shared directory. Failing to set this up may result in incorrect renders. If you are using the plugin, you may have imported footage into the Mocha GUI separate from the host source footage. Make sure any imported footage is also available.